For other uses, see Wuzhou (disambiguation). Wuzhou is located in eastern Guangxi bordering Guangdong province. It is at the confluence of the Gui River and the Xun River where they form the Xi River; 85% of all water in Guangxi flows through Wuzhou. The total area of Wuzhou is 12,588 km2 (4,860 sq mi). The Tropic of Cancer bisects the city. Despite its latitude, Wuzhou has a monsoon-influenced humid subtropical climate (Köppen Cfa), with short, mild winters, and long, very hot and humid summers. Winter begins dry but becomes progressively wetter and cloudier. Spring is generally overcast and often rainy, while summer continues to be rainy though is the sunniest time of year. Autumn is sunny and dry. The monthly 24-hour average temperature ranges from 12.2 °C (54.0 °F) in January to 28.2 °C (82.8 °F) in July, and the annual mean is 21.24 °C (70.2 °F). The annual rainfall is around 1,453 mm (57 in), and is delivered in bulk (~47%) from April to June, when the plum rains occur and often create the risk of flooding. With monthly percent possible sunshine ranging from 17% in March to 55% in July, the city receives 1,738 hours of bright sunshine annually. According to the 2010 Census, the prefecture-level city of Wuzhou has 3,273,300 inhabitants and a population density of 260 inhabitants per km². The population is 13.22% higher than in 2000 (the average annual population growth for the period 2000-2010 was of 1.25%). 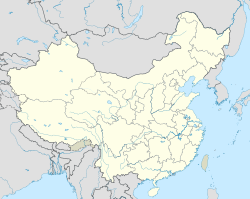 The dominant ethnic group in the prefecture-level city is Han Chinese but there are also Zhuang, Yao and others. Wuzhou traditionally belongs to the Cantonese cultural and linguistic region, so most people speak the Wuzhou dialect of Cantonese and Mandarin as a result of Central Government's Mandarin promotion policy. Wuzhou has 3 counties, 1 county-level city and 3 districts. A restaurant in Wuhan advertising "Genuine Wuzhou Guilinggao"
Amongst the agricultural products produced in the region of Wuzhou, one of the most favoured snacks is Wuzhou honey date (梧州蜜枣). Guilinggao jelly is also described as a "Wuzhou delicacy". Bingquan Soybean Milk is also welcomed by people and is in the list of premium choices for breakfast. Wuzhou has become a hub of the synthetic gemstone trade, particularly specializing in corundum, spinel and cubic zirconia. Wuzhou Changzhoudao Airport has flights to Guiyang, Zhuhai and Chongqing, and is capable of handling Boeing 737 Classics and CRJ-200 CRJ-900 on its 1800M runway. Wikimedia Commons has media related to Wuzhou.